Happy Sunday! So I didn’t do a Weekly Wrap post last week because I was still in my workout funk. I’m happy to report that I’m now back to actually “wanting” to do my workouts. Not sure why I was in a funk but I’m just happy that it’s over now. I really enjoyed this class! Of course my legs were like “Girl, what are you doing?” but I pushed through. Monday was also Veteran’s Day. Thank you to all those who have served to protect our country. We don’t thank these men and women enough in my opinion. I’m so thankful for my treadmill, especially as we enter winter. It gets dark here super early, and I hate running in the dark after work, so I can always rely on my treadmill. I definitely needed to spend some quality time with my foam roller after my boot camp class! My legs weren’t happy with me, but it was nice to get in a run before Thursday’s snowstorm. Rest Day. It was nice to have a rest day after 6 consecutive days of workouts. I was also able to run a few errands after work which was nice. I figured I should try to get in a semi-long run since I have the RnR San Antonio Half Marathon in 2 weeks! For the first time in a very long time, this run felt pretty good. The weather was great, there was very little wind and my hips weren’t bothering me too much (KT tape for the win)! This run reminded me why I actually love running. It felt great to use this class to flush out my legs after yesterday’s run. I like ending my week with spinning every Sunday. I’m so happy that I’m back to my normal self this week. It’s always weird when I hit a workout funk because I’m someone that loves to exercise. I just felt off the past few weeks but now I think I’m back. My runs went well this week. I’m still experiencing some pain with my hips but just trying to work through it. I enjoyed the kickboxing class that I took on Monday and I’m planning on taking it next week as well. As I mentioned, on Thursday we got our first snowstorm of the season. It was absolutely absurd how every state in the tri-state area (NY, NJ and CT) was unprepared for the storm. Streets weren’t salted or plowed. It took me 90 minutes to drive a mile – ONE FREAKING MILE. I was beyond pissed off when I finally got home. Then I started seeing horror stories on social media of people being stuck on bridges, side streets, etc. It took most people 4-8 hours to get home. I’m sorry but this was a complete embarrassment that all 3 states literally shutdown in 4-6 inches of snow! All 3 states need to do MUCH better and actually be prepared for storms. In other more positive news, I finally signed up for Orange Theory Fitness! They are opening up a studio in my city in March but were running a Founders discount rate if you sign up before the opening. I signed up for the Elite package which consists of 8 classes a month. I’m really looking forward to trying the classes next year and I hope that they will help with my endurance. How was your week? Did you get any snow? Are you running a Turkey Trot on Thursday? Glad you’re out of the funk and good work this week. I need to start a spin habit again. I felt like we were somewhat prepared for the snow on Thursday but I was convinced that it would just turn out to be rain! So I was shocked when it actually snowed quite a bit. I think the worst part was the ice though. Glad you are out of your workout funk! Looks like a great week! Luckily we didn’t get too much ice or it would have made the day 10x worse! I was really surprised at how unprepared we were here – it was crazy! We all get into workout funks every once in a while. I think they are just a way of your body telling you that you need a little more rest. (or more chocolate lol) Glad to see you back and feeling good. Have a happy Thanksgiving! I think you’re right. It seemed like I was much better once I took things slow last week. Boo to that commute! There is nothing more frustrating than sitting in traffic thinking “I could run this faster than drive it!”. Hopefully people will remember how to drive in the snow again soon. Good luck on your race Thursday! I’m running a half on Saturday. Hoping for good weather! LOL that was totally my thought. I was considering just parking my car somewhere and walking home. I’ve never seen traffic that bad during a snow storm. Good luck on your half on Saturday! Woohoo for Orange Theory! I hope you love it as much as I do. I found it helped my speed more than my endurance, but the cross-training is great too. Glad you are out of your funk. Maybe your body was tired and just needed more rest than you realize. You can add the DMV (DC, MD, VA) to the states unprepared for the snow. I guess no one believed it would really snow before Thanksgiving. Sorry that DMV was not prepared for the snow either. Lets hope that these states get it together for the next snow storm. The inability to handle the storm was crazy. Friends were commuting from the Bronx to Rockland (opposite Westchester on the Hudson if you don’t know it) and it took upwards of six hours. Luckily my subway line was relatively OK.
Glad you’re de-funk-ified. I wondered if I just missed your post as I was way behind this week. I’m definitely looking forward to the cinnamon buns after the 5k! I totally believe that it took your friends 6 hours. Almost everyone I know has similar horror stories. It took one friend 3.5 hours to drive 18 miles on I-95. I really hope that the tri-state handles the next snowstorm much better. Oh, a turkey tro 5k followed by a cinnamon roll, I love it! I’m doing a race Thursday and then my husband is making his “famous” homemade cinnamon rolls…So we’ll be enjoying a similar holiday celebration, run and rolls, ha! Glad you’re feeling back to your normal self. I think its the seasons changing too..
I’m so excited for the turkey trot on Thursday. I’ve heard that the course is hilly but I don’t really care since I’m just running for fun and will take my time. The cinnamon roll at the end of the race will be awesome! That’s so cool that our husband is going to make homemade cinnamon rolls – your house is going to smell so good! Yes it was quite embarrassing that everything came to a halt for 4-6 inches. We’ve dealt with way more snow and it wasn’t that bad. I think it was just the perfect storm of no salt, no plows, wish hour traffic and getting more snow than anticipated. Glad to hear that your funk is behind you. We all have those rough spots and they eventually go away. Love your “Come on legs…” graphic! I need to have that conversation with my legs! The “Come go legs” graphic made me laugh when I saw it online so I knew I had to use it one day. Thursday’s run fit the graphic perfectly haha. We definitely all go through funks. I think it’s a clear sign we just need a break, even from the thing(s) we love most. I’m glad you were rewarded with one of those great runs this week. I’ve had a couple of those lately and they sure help with the motivation. I’m interested in your review of OT classes. Keep us posted. Thanks for linking! I agree. Looking back, I’m glad I didn’t force the workouts because it would have just made me miserable. The good run on Saturday was great and I hope I can have more runs like that in the future. The OTF studio will not open until March but I’ll be sure to review it on my blog once I take a few classes. I can’t believe they were that unprepared for snow! You’d think they’d be used to it by now. Sorry you had to deal with that. But I’m glad that your Saturday run felt so good! Hopefully that made up for some of the week’s frustration. It was really unfortunate. Granted the estimate was originally 1-3 inches, but once it started going down heavier, they should have been prepared with salt and snow plows. I’m hoping that this doesn’t happen again. Saturday’s run was great and I hope I can repeat that again soon. Wow! That snowstorm caused one helluva cluster! How fun to be trying out OTF! There’s one sort of near me but in the opposite direction I usually go. Plus I can’t justify it + my gym membership. We both had fabulous 8 milers. Yay! It really did and I hope that they are better prepared for the snow we’re expecting on Tuesday! I really can’t wait to try out OTF. I wish they were opening sooner but I’ll just have to wait until March. I think it’s important to take time off, especially when workouts aren’t flowing. Glad to hear you’re back at it. I’ve been hearing stories about the storms that hit the Northeast. I don’t miss driving in those conditions. That’s true. Looking bad, I’m glad that I didn’t try to force anything. Glad your funk has passed – you had a great week! But that commute home?!? I can’t believe they weren’t prepared for the storm! I mean seriously, it’s the northeast! Of course, I say that, but people in Boston on Friday were all driving as if they’d never seen snow and rain before! LOL! I also can’t believe that they wee not prepared for the storm, especially with the amount of taxes we pay in CT! I;m glad you are feeling motivated again! I now am feeling your “funk”. I think it was the weather this week! Thanks! It feels good to be back to my normal self again. That’s great that the funk is over! Your Turkey Trot sounds great! I want a cinnamon bun & a sweatshirt, but I really do think I’m going to skip it this year. Just too damn cold! Well, we’ll see how I feel Thursday. Luckily I did not have to go anywhere Thursday. It was absurd! I mean, seriously, we’re upstate NY & we should be used to that s*#t, even if it is early. Yeah I saw the temperature for Thursday and I was like yikes! I’m really going to have to layer up for the run. Thankfully its a 5k and not a half marathon so I won’t be out there too long. Oh I was beyond pissed on Thursday over the snow. I was very low on patience toward the end! 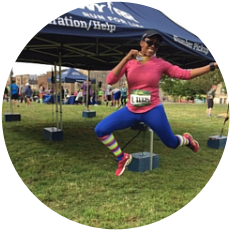 That’s crazy 4-6 inches of snow put everyone in such a funk….it’s not like snow is unheard of up there LOL Glad your fitness funk has ended…I’m hoping mine is short-lived 😉 I also have a turkey trot on Thanksgiving….I’ll be twinning with you (but not in costume). Exactly! We deal with major snowstorms and yet 4-6 inches crippled the state – it was ridiculous! I hope that your workout funk ends soon. Hope you have a great turkey trot on Thursday! Great week! I usually run a Turkey Trot, but I’ve been racing a lot, so I’m skipping it this year. Good Luck on yours!! Glad to hear the funk is gone 🙂 That Saturday run sounds like it was perfect! That’s so cool that you’ve signed up for Orange Theory. I keep hearing really good things about it. I’m really looking forward to Orange Theory. I kind of wish they were opening up earlier! Working my way out of a running funk, it happens to all of us. Good luck at RNR~! The snow seems to have snuck up on lots of areas early this year. No snow for us yet but I keep hearing that it’s coming. I hate the cold but if it’s cold it might as well snow! I’m the opposite, I don’t mind the cold but hate the snow, lol. I love it when it’s coming down because it’s so pretty but hate driving in it. I love your No Quitting shirt! I almost signed up for the RnR San Antonio race. A few years ago, I got stuck for 13 hours (2 inches of snow) in Atlanta. After living in CT for a couple of years after that, I’m shocked to hear they weren’t prepped for that storm that came through! Happy Thanksgiving! OMG I think I remember that snowstorm in Atlanta. I feel like it was all over the news how the city just came to a halt. CT really should have been better prepared and I hope this doesn’t happen again.